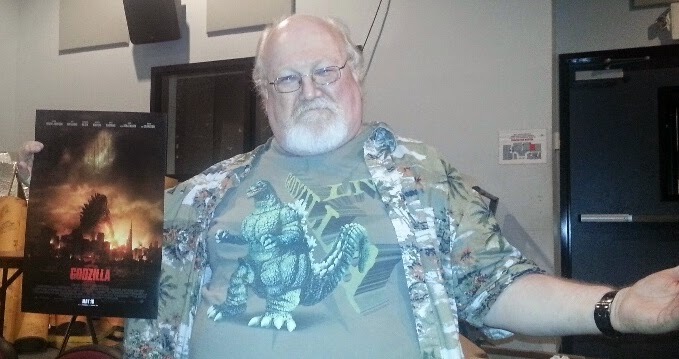 The Moving Picture Blog: Godzilla, dammit! First, I gave my students an introductory lecture about Gareth Edwards' Monsters, duly noting that Edwards had gone on to direct the new Godzilla. Then, after I screened Monsters, ace publicist Jennifer Kane visited the class to give students passes for a Godzilla screening, Godzilla Frisbees, Godzilla dogtags and Godzilla buttons. And then I gave the final exam, a multiple-choice test. One question: What summer blockbuster was directed by the director of Monsters: X-Men: Days of Future Past, Transformers: Age of Extinction, Dawn of the Planet of the Apes or Godzilla? And so help me God: A few students got the question wrong. But here's the corker: I was wearing a freakin' Godzilla T-shirt the whole time. And I even showed them this video. Maybe I'm not really cut out for this teaching stuff after all. Nah, but maybe some of your students are not really cut out for this learning stuff after all. Wow, I want to be in your class! !